Venom Finds A New Host As Part Of Marvel NOW! On Wednesday, Marvel Comics revealed their initial offering of titles launching or returning as part of the Marvel NOW! publishing initiative. Among those titles was a brand new Venom ongoing series from Mike Costa and artist Gerardo Sandoval, and it seems like that title is going to shake up the symbiote’s status quo in a major way. If you haven’t been keeping up with Venom’s goings-on in recent years, here’s the rundown. After spending time attached to Mac Gargan, the original Scorpion, the symbiote came into the possession of the United States government and was bonded to Flash Thompson. Thompson was formerly Peter Parker’s high school bully and, ironically, Spider-Man’s biggest fan. Thompson enlisted in the U.S. Army and lost his legs during the Iraq War. The symbiote allowed him to walk again and, eventually, he joined up with the Guardians of the Galaxy and, in his most recent series, became a Space knight. But all of that seems to be changing. The Guardians of the Galaxy are returning to Earth and it seems that the symbiote is using that opportunity to find a new host. But who is it? ComicBook.com reached out to Marvel for comment, and Editor-in-Chief Axel Alonso replied with a tease. “Venom is returning for an all-new series as part of Marvel NOW! But which Venom? Mike Costa and Gerardo Sandoval have some big ideas, and fans are going to lose it when they learn who’s wearing the symbiote,” Alonso said. So who is in the new Venom? 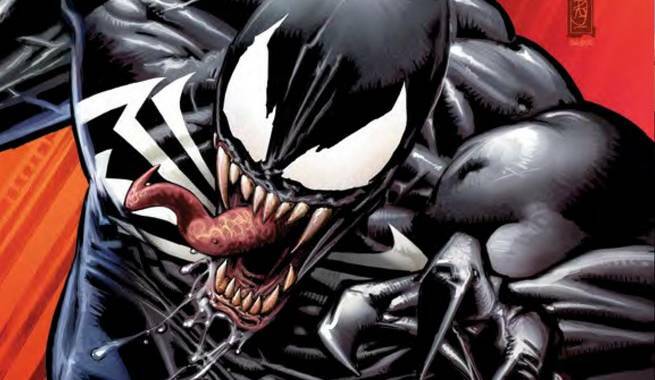 Fans will find out when Venom kicks off as part of Marvel NOW! this fall.